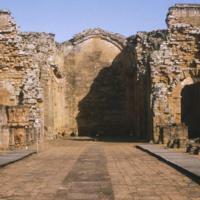 This is a view down the central nave of the main church at La Santísima Trinidad, Paraguay. The church originally included a dome, vaults over the nave, and two large sacristies. This was, by any measure, a major architectural undertaking, supervised by Jesuit fathers and built by indigenous Guaraní over several years. Originally the church, built of sturdy sandstone blocks, would have been roofed with semi-cylindrical vaults—an architectural feature introduced from European buildings. Although bare today, in the 1730s and 1740s, the church walls would have been well decorated, largely with works created by the Guaraní. The pulpit seen here was, like the church and much of its decoration, carved of stone with imagery derived from European models. The Society of Jesus was the patron of the mission complex at La Santísma Trinidad. The church architect, Juan Bautista Prímoli came from Milan to South America, although he did not supervise work on site. The architect of the church, Juan Bautista Prímoli, drew upon European forms for his design. It was up to the local Jesuits and Guaraní assistants to translate those plans into an actual structure. 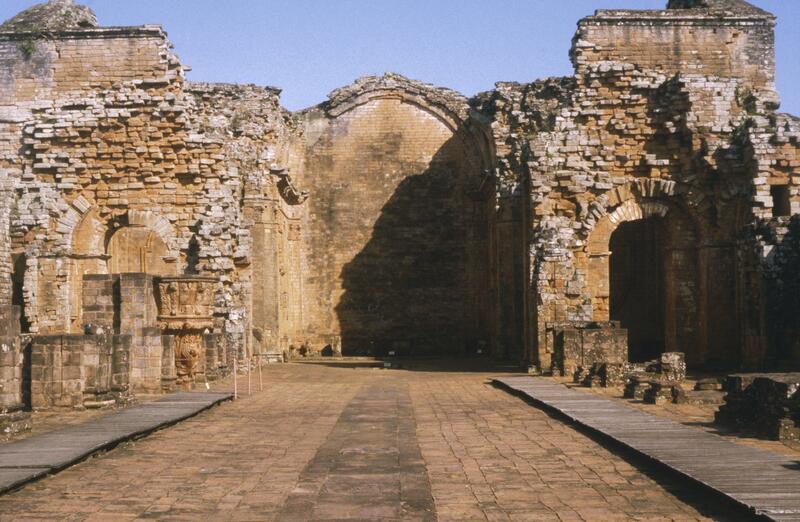 After the Jesuits were expelled from Spanish America in 1767, the church and its associated buildings fell into ruin. Of all the 30 Jesuit missions in the basin of the Río de la Plata, this is the best preserved. The church at La Santísima Trinidad makes it clear how much the Jesuits were willing to invest in the “civilization” of the Guaraní. While less is known about the desires and ambitions of the Guaraní who worshipped here, evidence suggests many took pride in their accomplishments for the Church.